OGIMAUH-BINAESSIH (Okemapenesse, meaning “chief little bird”; Wageezhegome, Wakeshogomy, Weggishgomin, meaning “who is like the day”; John Cameron, Captain John), Mississauga Ojibwa chief, member of the eagle clan, and farmer; b. May 1764 at the Credit River (Ont. ); d. 30 Sept. 1828 at the Credit Mission (Mississauga), Upper Canada. As a young man Wageezhegome witnessed the destruction of his people’s way of life. The arrival in what is now southern Ontario of thousands of white settlers after the American revolution quickly led to the surrender of much of the Mississaugas’ hunting territory and the loss of their fishing grounds. Close contact with the whites also introduced a series of epidemics, such as smallpox, against which the Indians had no immunity. In the 1790s the new diseases carried away more than 150 of the 500 members of the Credit River band at the western end of Lake Ontario. As the Mississaugas’ old society collapsed, many simply sold whatever furs they trapped, or fish they caught, for the white man’s firewater. Almost alone among his people Wageezhegome chose to follow a different path. Recognizing that the world of his youth was gone forever, the young warrior earnestly sought to adjust to the society of the white people around him. From David Ramsay*, the notorious Indian-killer and fur trader, he learned some English and acquired a rudimentary idea of how to farm. He attended a school and even adopted the name of John Cameron, an Indian Department official, as his English name. Finally the energetic Wageezhegome built himself a comfortable log cabin on the Credit River flats, where he raised some Indian corn and potatoes., As if to symbolize his transformation he also discarded his Indian costume of breechcloth and leggings, and began wearing store-bought trousers. The Mississaugas respected him, selecting their “westernized” tribesman in August 1805 to succeed his father as one of the band’s two chiefs. It was presumably then that he received the title Ogimauhbinaessih, although even after this date his other name continued to be used. With the band’s other “principal men and women” he signed the surrenders of 1805, 1818, and 1820 by which the Mississaugas, unable to resist white settlement any longer, ceded their remaining lands on the northwestern shore of Lake Ontario and retained only a small tract on the Credit River. There Ogimauh-binaessih continued to live in his log cabin and to farm, while his fellow tribesmen dwelt in wigwams and tried to support themselves by fishing and hunting and by making baskets and brooms to sell to the white people. When Peter Jones* arrived at the Credit in late 1824, Ogimauh-binaessih gave the native Methodist missionary his full support. Over a decade earlier he had allowed himself to be baptized, and since that time, he confessed to Jones, “I have again and again wished that the good white christians might come and plant the christian religion amongst us, and teach us the right way we should go.” A recently contracted family tie also drew him toward the Methodists. Shortly before Jones’s arrival the 60-year-old chief had married Wechikiwekapawiqua (baptized Catharine Cameron), the missionary’s 17-year-old half-sister. After Jones’s visit Ogimauh-binaessih travelled some 60 miles westward to the new community of Methodist Indians at Davisville, on the Grand River just north of present-day Brantford, where Thomas Davis [Tehowagherengaraghkwen] had invited them to settle. There the chief pitched his tent beside the mission house and immediately enrolled his young wife in the Methodist school. The following spring he returned briefly to the Credit, in Peter Jones’s words, “to advise the pagan Indians to forsake their evil ways . . . to leave off drinking the fire-water and to try to serve the Lord.” Many accompanied him back to Davisville. When in 1826 the Christian Mississaugas on the Grand moved back to the Credit River to found a model native agricultural settlement, the vigorous Ogimauh-binaessih helped as much as possible. He read passages from the Bible to his tribesmen, served as an assistant class leader in the church, and aided Peter and his brother John* in teaching farming techniques. At the Credit Mission Ogimauh-binaessih’s daughter, Charlotte, was born on 24 Feb. 1828. Later that year the respected chief suddenly became ill and he died on 30 September. 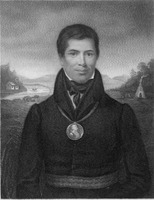 Peter Jones, who succeeded him as chief, later recalled that he had said shortly before dying, “I thank the Lord that I have lived to see all my people serve the Great Spirit.” Ogimauhbinaessih was a dedicated modernizer or, to use the term frequently employed by the Department of Indian Affairs and the Christian churches later in the 19th century, a very “progressive” Indian. UCC, Central Arch. (Toronto), Credit Mission, record-book. Canada, Indian treaties and surrenders . . . [1680–1906] (3v., Ottawa, 1891–1912; repr. Toronto, 1971), 1: 35, 48, 53–54. Peter Jones, History of the Ojebway Indians; with especial reference to their conversion to Christianity . . . , [ed. Elizabeth Field] (London, 1861); Life and journals of Kah-ke-wa-quo-nā-by (Rev. Peter Jones), Wesleyan missionary, [ed. Elizabeth Field and Enoch Wood] (Toronto, 1860). D. B. Smith, “The Mississauga, Peter Jones, and the white man: the Algonkians’ adjustment to Europeans on the north shore of Lake Ontario to 1860” (phd thesis, Univ. of Toronto, 1975). Donald B. Smith, “OGIMAUH-BINAESSIH,” in Dictionary of Canadian Biography, vol. 6, University of Toronto/Université Laval, 2003–, accessed April 20, 2019, http://www.biographi.ca/en/bio/ogimauh_binaessih_6E.html.